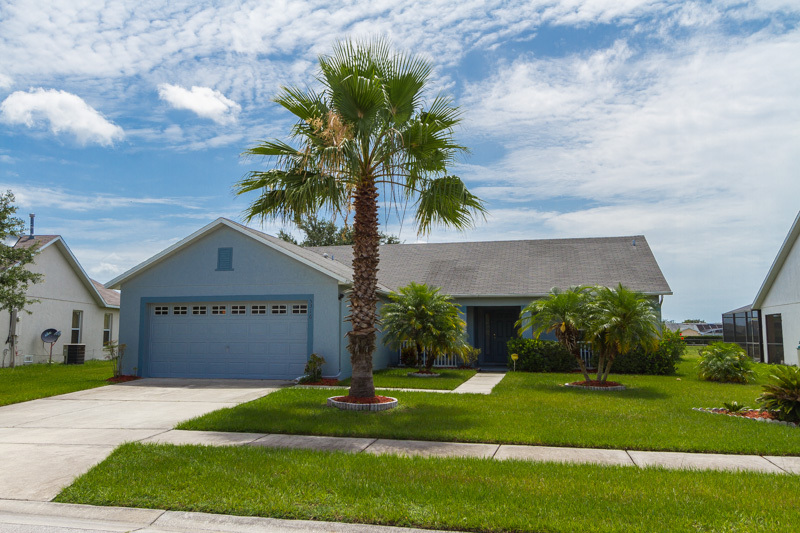 3 bedroom, 2 bathroom villa in the Crescent Lakes community. Owned by MARK AND URSULA KRAVIS. Ref: 500. 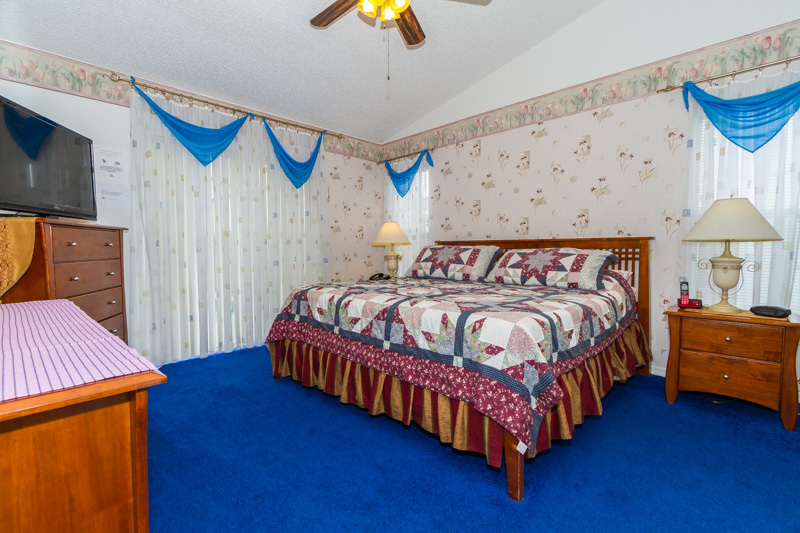 Second Bedroom features a Deluxe Queen Bed, central Air and Heating, ceiling fan, a 32" HD Stereo Cable TV, and DVD Player. 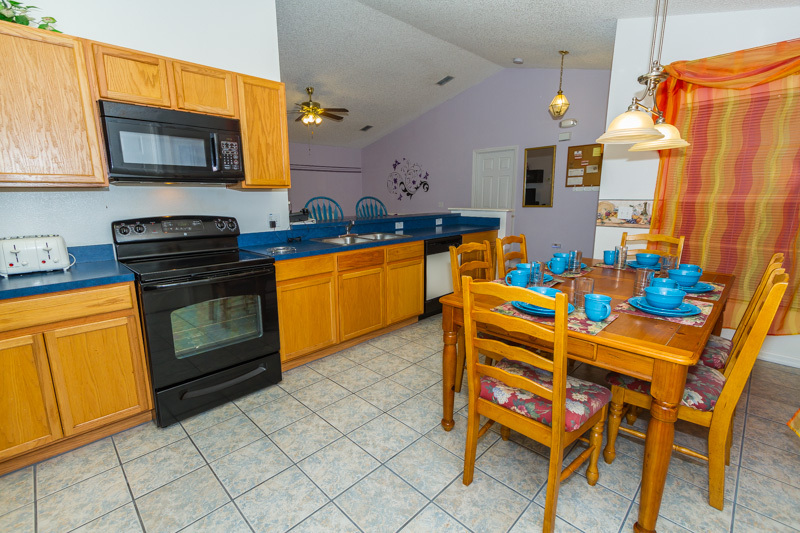 This newly remodeled 3 Bedroom, 2 Bath villa home is located in the quite, secluded and secure area of Allmanda Grace at Crescent Lakes, one of the finest and most well respected vacation villa areas in the entire Orlando area. In addition our villa is 100% owned, free and clear from any Bank notes, so there is no fear of a Bank take over and the villa may not be open for rentals. 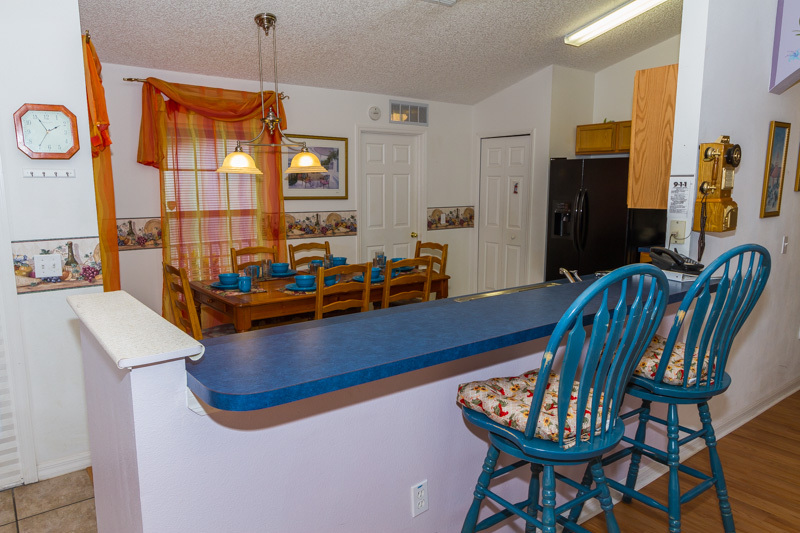 Our nice little villa is fully equipped with all the comforts of home to include all kitchen appliances, washer, dryer, water cooler and even down to a hair dryer and the last teaspoon that you will need. Central Air Conditon and Heating. 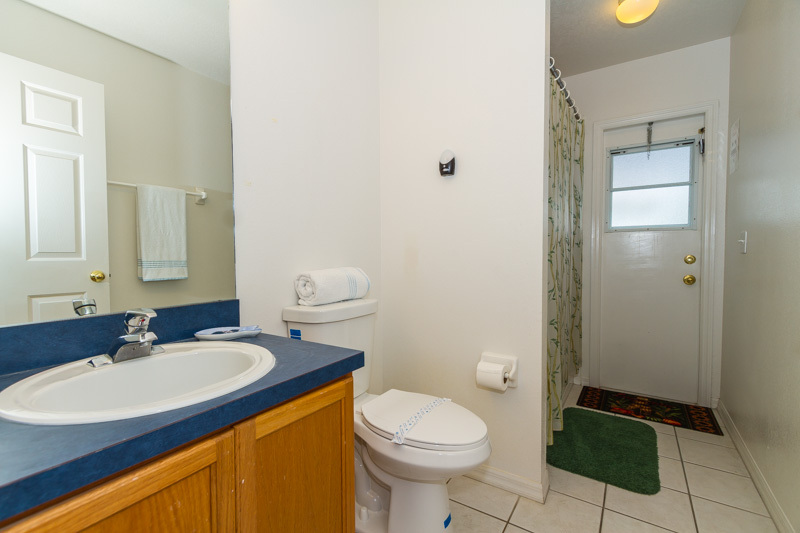 All the comforts of home included in the rental price. 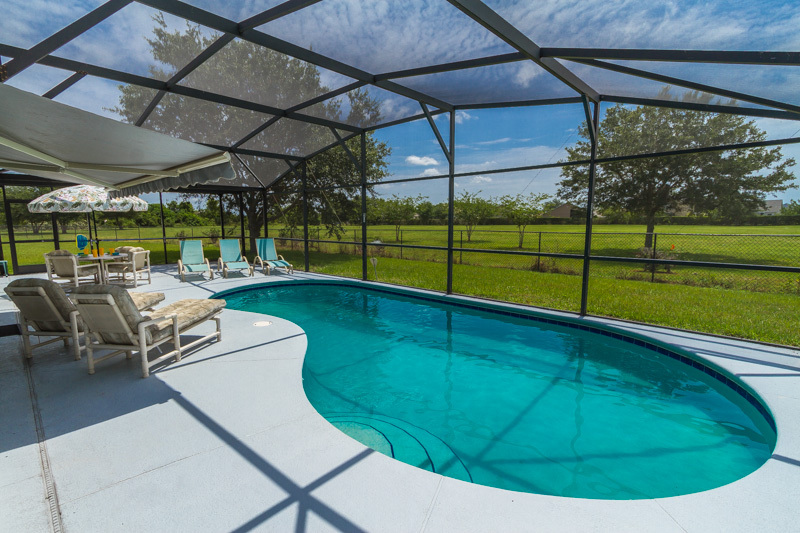 The swimming pool and over sized pool deck are fully screened-in with some of the finest pool furniture that Orlando has to offer. 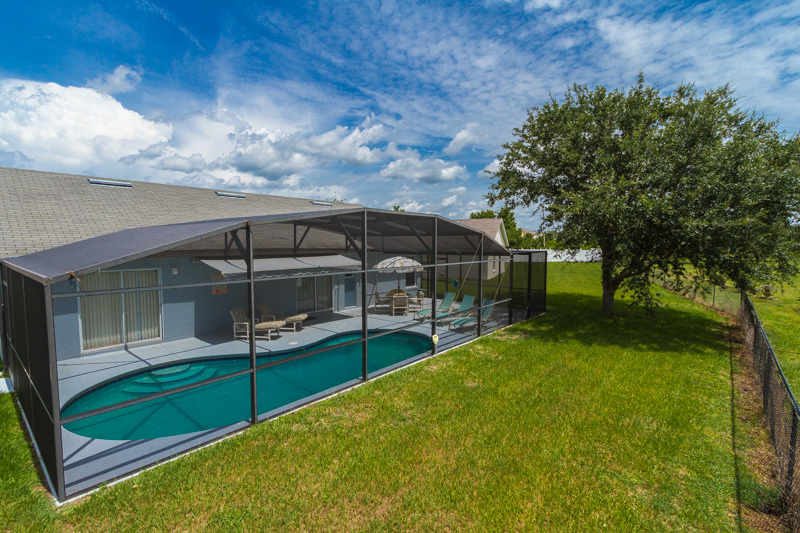 There is a remote control awning if you need a little time out of the Florida sun. You can relax in the sun or cool in the pool after a long day on one of the close by Disney Parks. The pool can also be heated for your comfort in the winter months at an extra charge per week or at a three-day minimum rate. 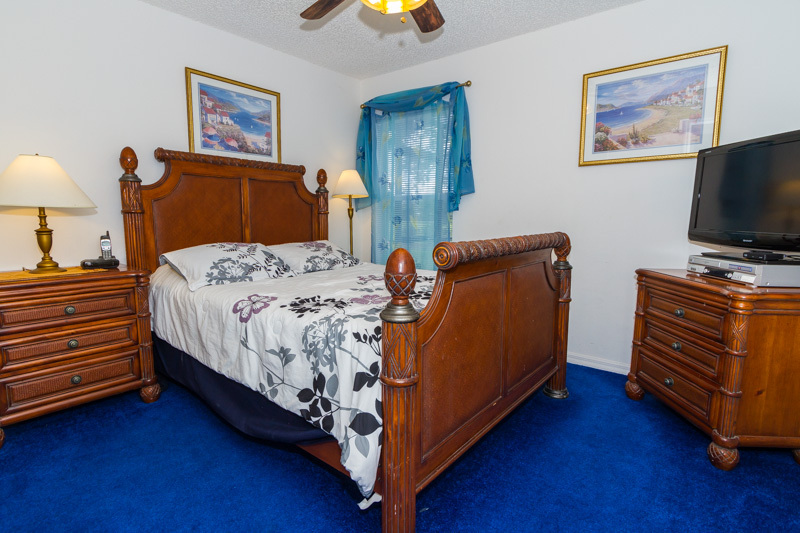 The master bedroom has a full size walk-in closet, King Size Bed, lavish curtains, new carpets, ceiling fan, 39 inch HDTV, Digital Cable, Cordless Phone and Answering Machine for your comfort and pleasure. The Master Bath a-joins the bedroom with a double sized shower picture mirror, deluxe toilet, large bath towels and his and her matching sinks. 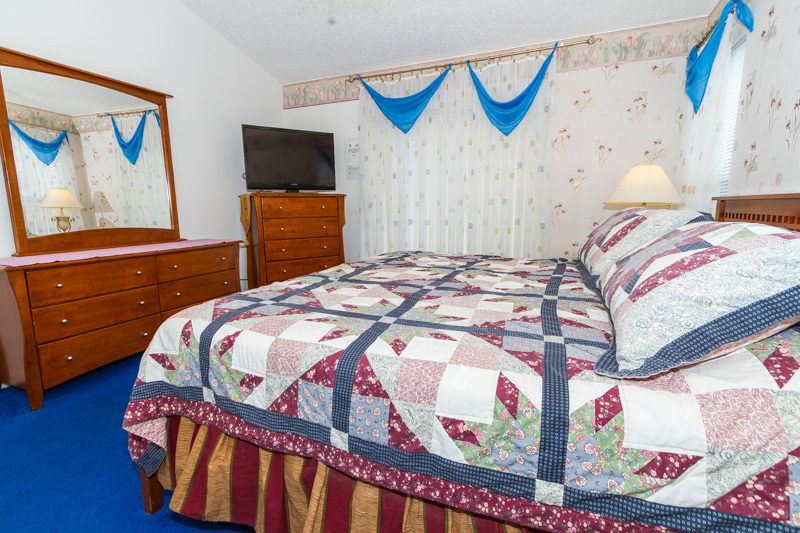 The second bedroom has a full Queen Size Bed, 32" HDTV, Digital Cable, DVD Player, Ceiling Fan, deluxe curtains, new carpet and Large Walk-In Closet. The third bedroom sports Twin Beds, Ceiling Fan, 32 Inch HD Cable TV and Digital Cable, deluxe curtains, new carpets and another Large Walk-In Closet. 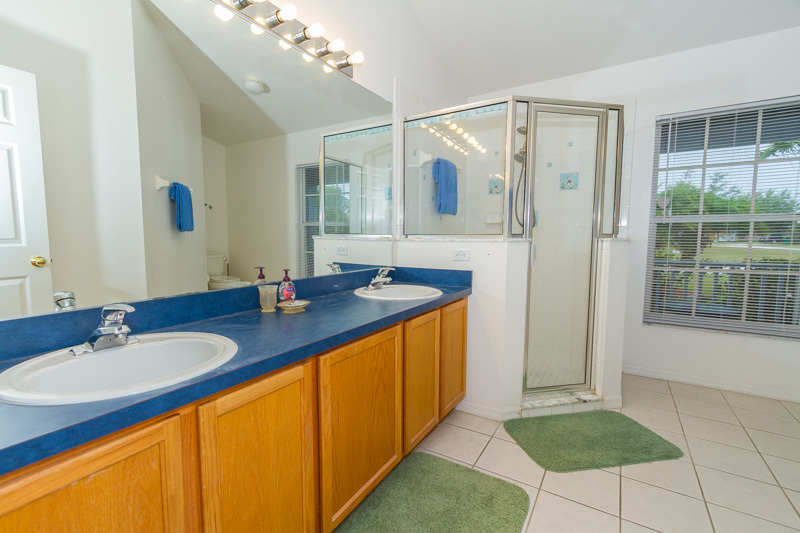 The second bathroom a-joins the second and third bedrooms, featuring a shower and bath combination, deluxe toilet, picture mirror, large bath towels and hair dryer. You may also enter and exit the pool area from this bathroom. 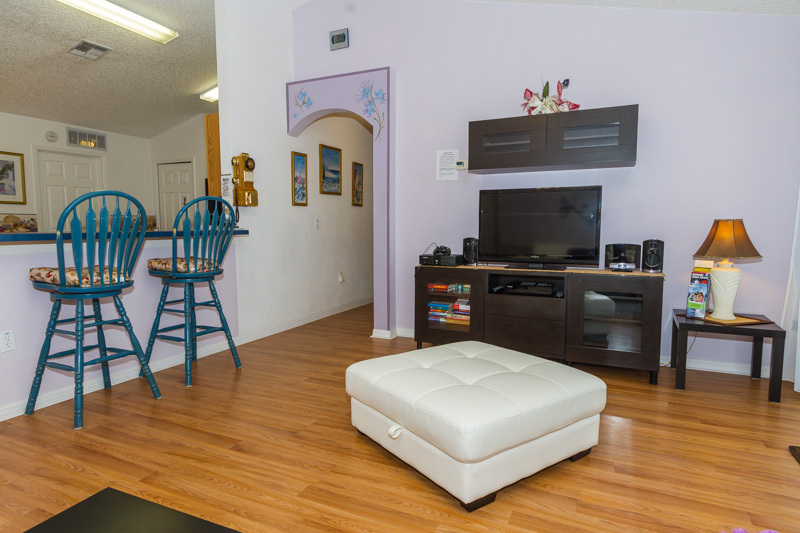 The living room area offers a full couch, love seat, lavish curtains, ceiling fan, hard wood floors, bar stools and an entertainment center with a 39 inch HD Stereo Color TV, 300 Channel Digital Cable, DVD, X-Box, Nintendo Game Cube, all with free games, a VCR and CD Stereo System. The kitchen offers all the features that you would find in your own home including microwave oven, stove, dishwasher, coffee maker and ice maker in the fridge. 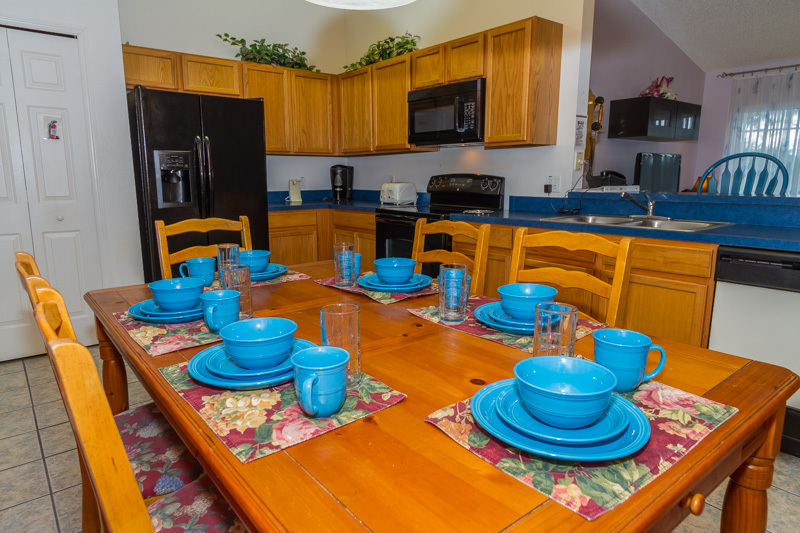 The kitchen is also equipped with pots, pans, dishes, flatware, cups, mugs and drinking glasses. A full dining area that features lavish curtains and wall borders is provided for 6 people to relax and have meals together. An a-joining bar area to the kitchen offers bar stools for a quick meal or snack. The entire villa home is fully climate controlled with air conditioning and heating for your living pleasure. Limited access to the area that the home is located in, combined with a mobile radio equipped security patrol adds to your living pleasure. Disney is located 15 minutes away; with other parks and the city of Orlando less than 20 minutes drive away. Tampa is a 50 minute drive, Daytona Beach is a little more than one hour away, Kennedy Space Center and Casino Ships are a short 45 minute drive from the villa home, with Miami only 2.5 hours away. The New Legoland Park is also less than 40 minutes drive from the villa. 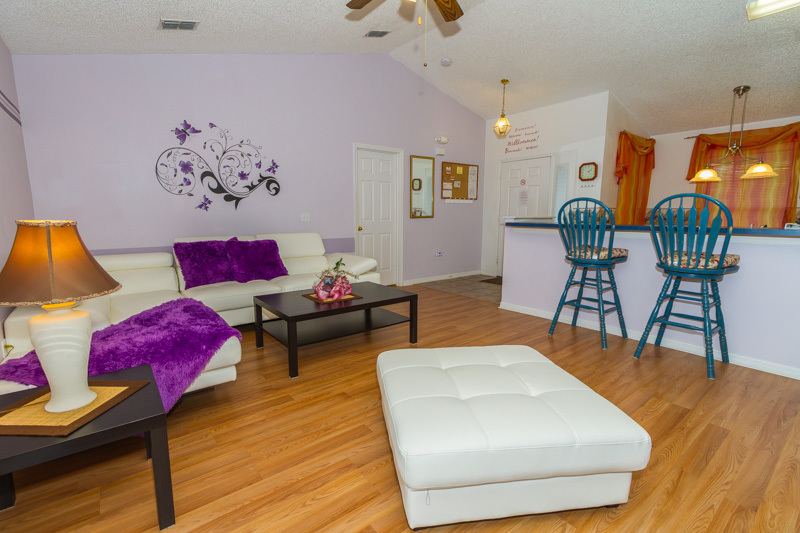 “THE BEST LITTLE VILLA IN ALL OF ORLANDO” IS WAITING FOR YOU! Average rating: 4.8 / 5 from 19 reviews. We had an enjoyable stay at this villa. It was lovely and clean with a super comfy king size master bedroom. Great facilities including a gas bbq. The villa was spacious for 2 of us. Pool heat was brilliant. Had a bulb go out contacted the management company and it was fixed almost immediately. Great service and communication from Mark I would definitely recommend this villa. Had a great time. House was spotless and was a pleasure to stay. Everything was as advertised. Will rent again! Great!! Nice rooms, big pool, well equipt, quite neighborhood, safe neighborhood, house manager next door easy to contact. Will stay there again !!! Great home from home and more! The villa has everything you could need and is clean and tidy. Mark has been very helpful throughout. Would thoroughly recommend and not hesitate to come back. 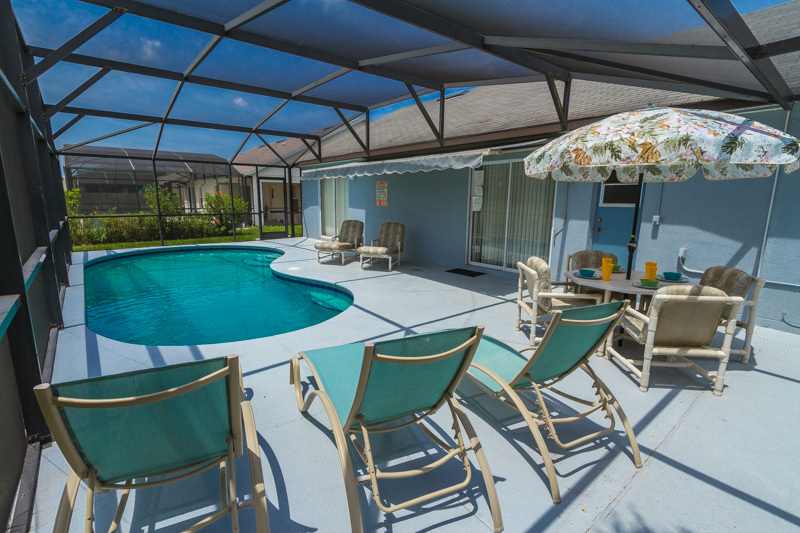 We had the pleasure of having 3 weeks at Mark and Ursula's Crescent Lakes villa for our family vacation, the villa was very clean and well equipped with a good sized pool. 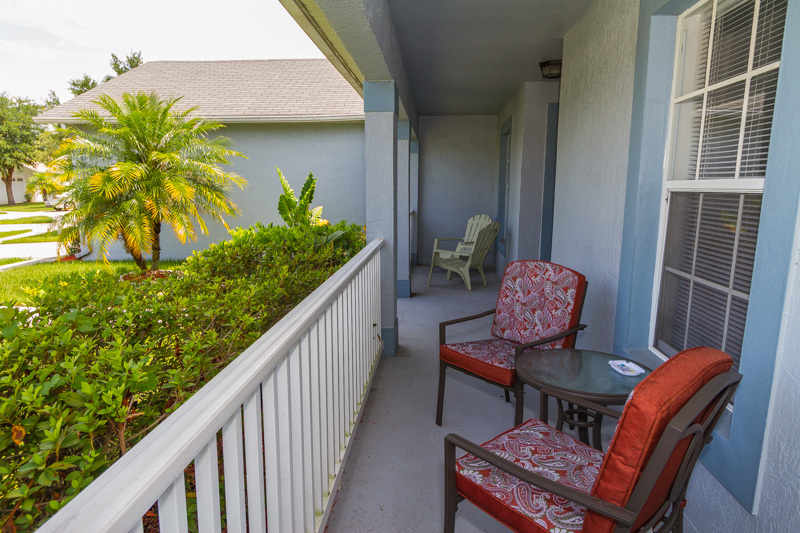 The villa is in a quiet residential location with easy access to the Disney, Sea World and Universal parks. We really enjoyed our stay in this lovely, well equipped house. It was in a quiet residential area and had no one overlooking. It was within easy driving distance of all the parks, restaurants and shops. We would have no hesitation in booking this home again if it was available. Mark the owner was easy to deal with. The Villa was well kept with everything you would need. Location is good and parks 30 to 40 minutes away. We like being near the 192 as our favourite eating places are there. Overall a well kept villa. The Villa manager was helpful to. Pool was good and having looked around at prices it was fairly priced. We would recommend this villa at any time. The villa is central but still good and quiet. 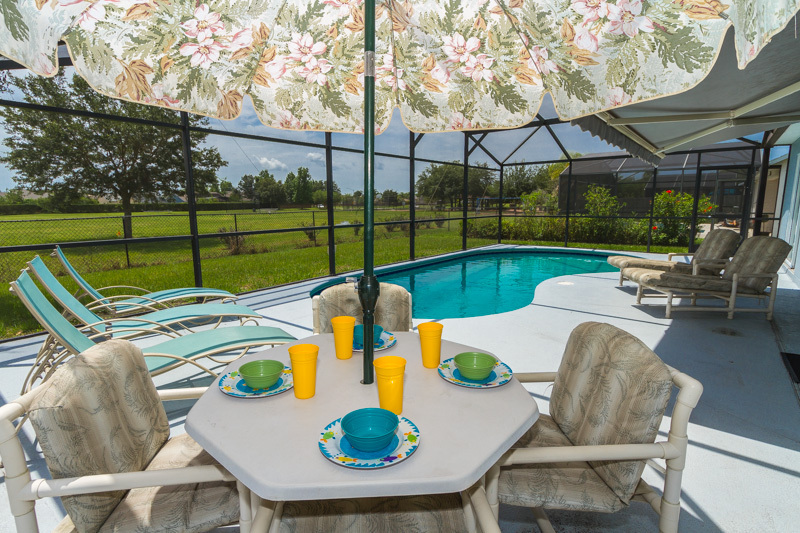 Everything you need for a holiday home offers this house and the pool is to enjoy fantastically beautiful. We would recommend this villa at any time. My wife and myself stopped at the Kravis villa on two ocations. They were both enjoyable stays in a villa equipped to the highest standards. The cleaners did a wonderful job because the place was spotless. Alas we couldn’t go back but we recommended the villa to a few friends and they went and enjoyed the same feelings we had experienced. I would recommend the Kravis villas without hesitation. Mark is on the ball if you have a question to ask, he’s response to emails is nearly always the same day. The villa is in a quiet area and was clean, spacious and comfortable and within easy reach of the parks. We unfortunately encountered a lot of rain for the week we were there so could not take advantage of the pool too much but it was clean and adequate. Local shopping was easy to find and near by. It was an ideal location for a week visiting the parks. very nice house with a lovely pool ! We had a wonderful 3 weeks! The house was everything we wanted and more! The pictures of the house are completely accurate. Each bedroom was spacious and clean. Kitchen was well stocked with everything you need for cooking. The pool was our favorite part, it was a great way to start and end the day. The house is located a 15-20 min. driving distance to the Walt Disney World and Irlo Bronson Highway, there are plenty of restaurants, grocery stores and attractions nearby. I highly recommend staying here because the owner is extremely responsive. He answered all questions in a timely manner and was very accomodating! We very much enjoyed our time at the villa. 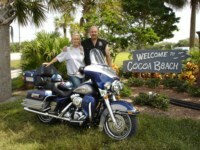 It was comfortable and in a lovely location and had everything that we needed. The kids particularly enjoyed the excellent pool! Very clean and well maintained villa in quiet neighborhood with all the amenities of home. We had a very nice week out there, the place was wonderful, quiet, very clean and well place for us. was fantastic all week long. Thank you Mark and Ursula ! We have just spent over 2 weeks at Mark and Ursula's villa at Allamanda Grace and had a most enjoyable time. It is in a mainly residential area which is very quiet and overlooks a green at the rear. 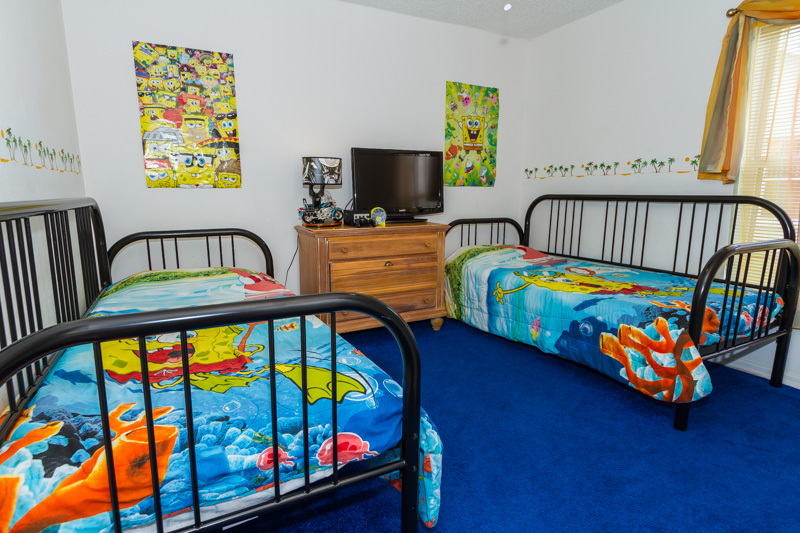 Everything that you could need is provided in the villa and we would recommend it for anybody who wants a quieter area, but still within reasonable distance of the Theme Parks. We certainly plan on staying there again. Your enquiry will be sent to villa ref 500 only. This page has been viewed 119976 times since 15 Dec 2002.